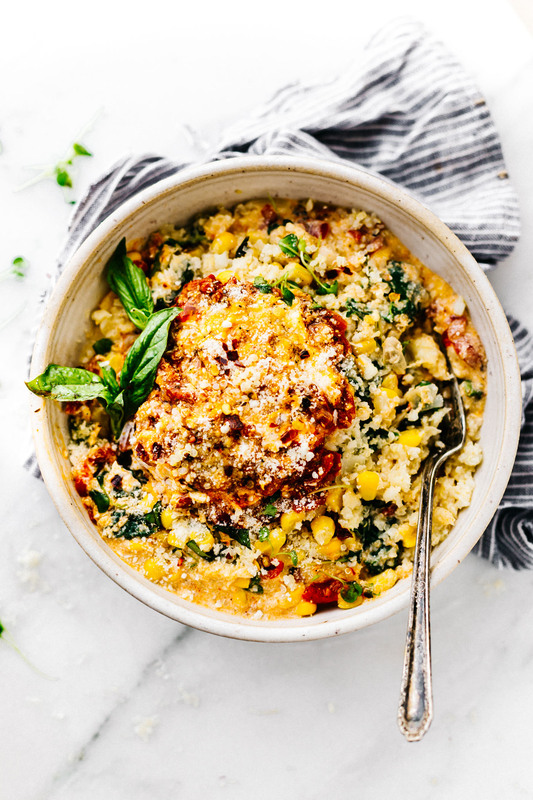 This Creamy Sweet Corn Cauliflower Grits recipe makes for a flavor packed one pot meal! 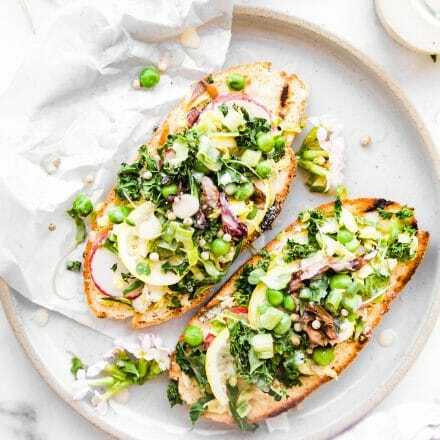 Vegetarian Comfort food made lighter and healthier! 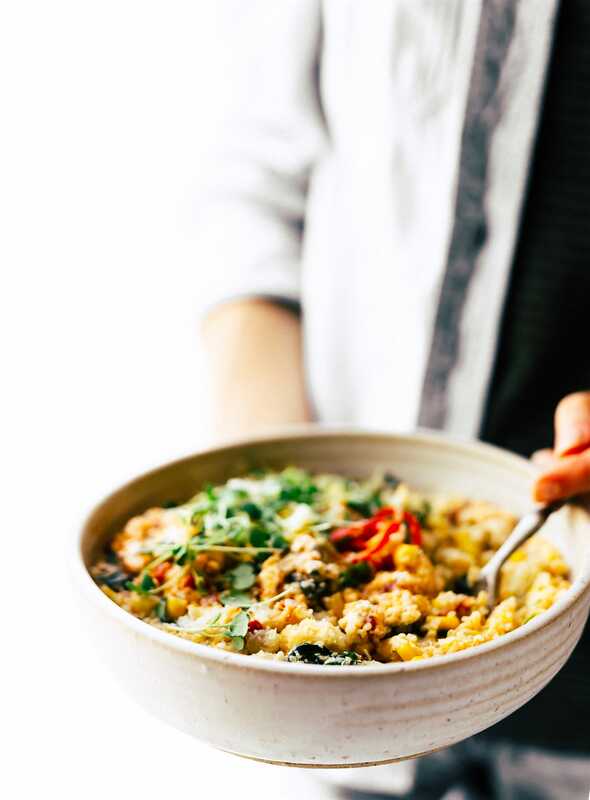 Cauliflower riced into “grits” with sweet corn, Gruyere cheese, spinach, basil, onion, and more! Ready in 30 minutes ya’ll! That moment. Moment of pure bliss. The first bite of something you’ve been dreaming of eating or making for months. Ya, that was this dish for me. Creamy Sweet Corn Cauliflower Grits. The crazy thing is we don’t even buy corn that much. Unless it’s for a soup. And cheese? Well, I am SUPER picky about the cheese I buy and eat. In a good way! More on that in a moment though. You see, a few weeks ago we drove up to Solitude Mountain for a weekend of work. Yes, I worked. As in, I locked myself up in the condo and tried to finish my cookbook manuscript. Ya’ll, it sounds crazy, but it’s the best place to focus. AWAY from home, surrounded by beauty, and at 10,000 feet! Haha! As we ended our weekend away, we stopped by a few produce stands as well as Whole Foods Market. There was fresh basil, onion, the greenest of leafy greens, cauliflower, and sweet corn that has never looked so good! Gah, some serious summer produce love I tell ya! It was at that moment I just knew; I knew HAD to buy some sweet corn and create something creamy, cheesy, and summer veggie-inspired. Oh and delicious! That’s a normal feeling, right? Oh no, no, no! My creation is anything but heavy, I promise. 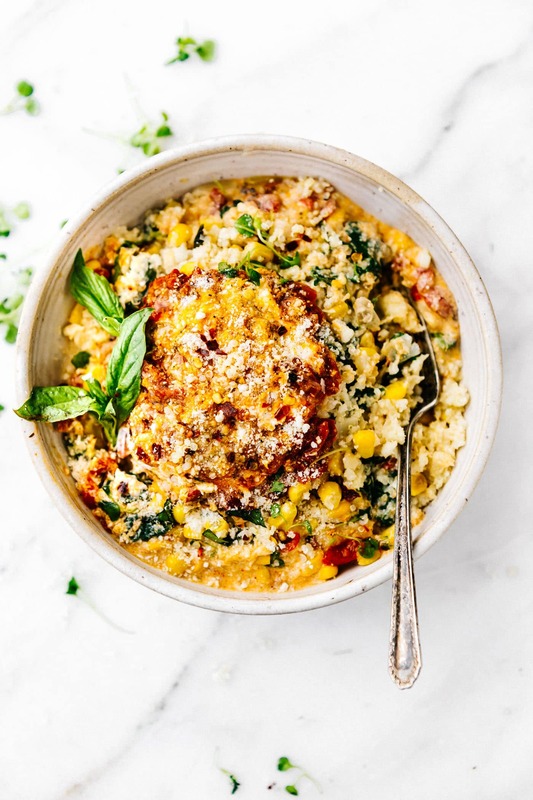 These Creamy Sweet Corn Cauliflower Grits are healthy, veggie-packed, and dare I label it? Low carb-ish friendly. If you want it to be. Stay with me here! All this summer produce can be used to make a wholesome and nourishing one pot dish! The key ingredient to pull it all together? For those of you who might not be able to digest lactose, I have good news! You can certainly fall in love with this cheese too! This aged hard cheese is made from raw cow’s milk and is low in lactose. In fact, almost all aged cheese is lower in lactose! Which also makes it more Low FODMAP friendly, depending on if you are reintroducing certain dairy. Some more KEY FACTS about Emmi Swiss Cheese! Sustainability – In Switzerland, Emmi Le Gruyère only buys Swiss milk bearing the “Suisse Garantie” (Swiss guarantee) label, which requires that milk comes only from producers who meet the requirements for sound environmental practice certification! Aged to Perfection – Using fresh cow’s milk from local farmers, cheesemakers create this cheese exclusively in copper vats, which allow quick temperature changes and impart a unique, complex character. 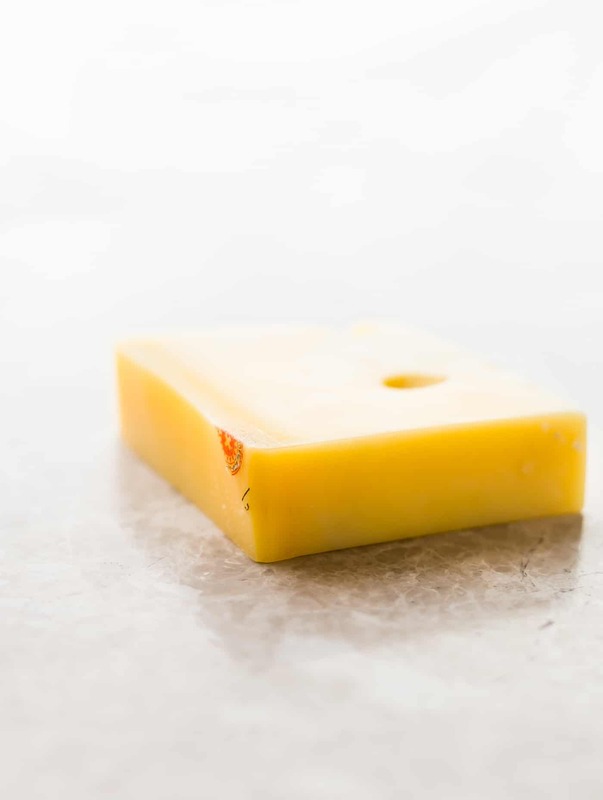 The cheese slowly matures in cellars, giving it a firm but pliant texture and a sweet nutty flavor. Now you know why I am so particular about my cheese choices! And why I couldn’t WAIT to use Emmi cheese to make this dish. Those FLAVORS! Don’t let the term “hard cheese” fool you though. This Gruyère is creamy and melts perfectly with the cauliflower grits! Speaking of grits. 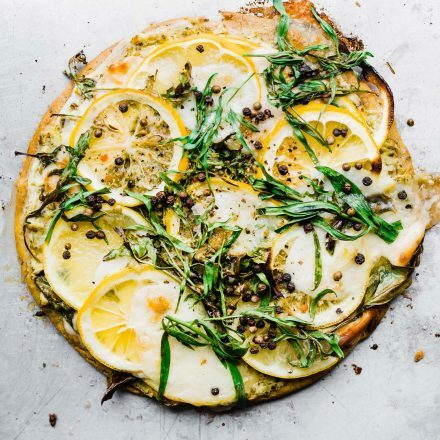 It’s time we make this FAUX veggie version! My southern roots are so happy right now! Just chop, rice, throw it in ONE PAN, cook, make it creamy, and VOILA! CREAMY SWEET CORN CAULIFLOWER GRITS it is ya’ll! This is what I like to call summer grits. 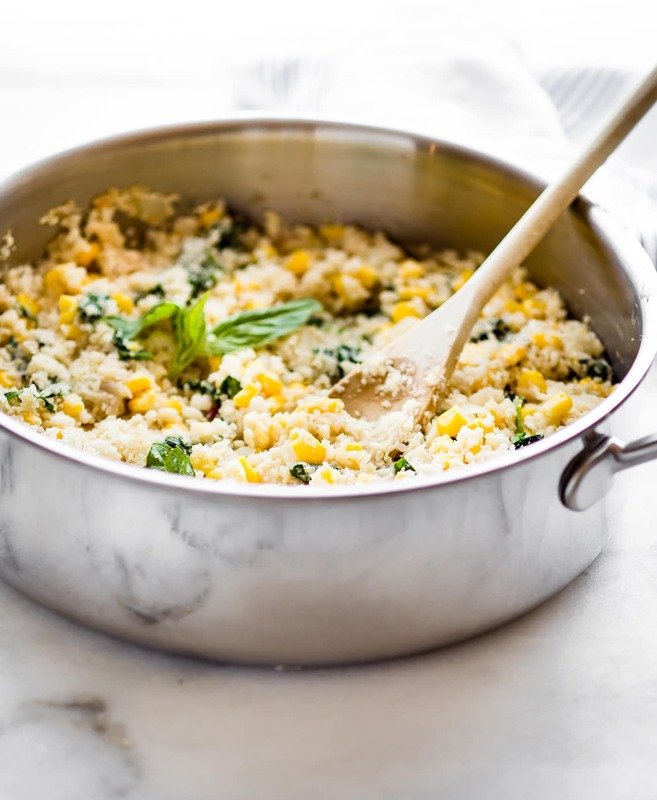 Sweet Corn Cauliflower Grits is a quick vegetarian one pot meal! 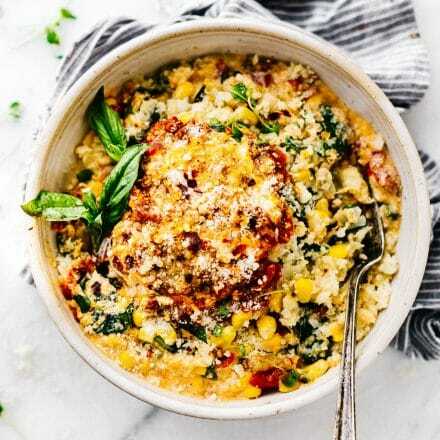 Comfort food made healthier! 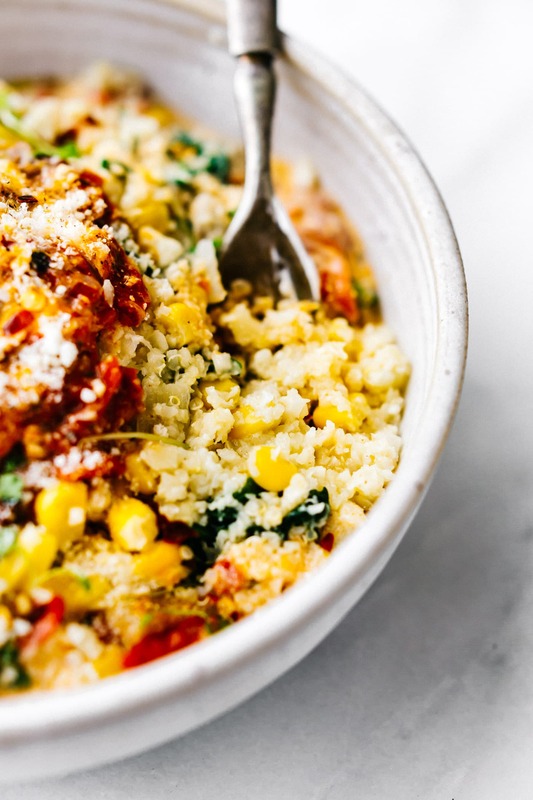 Cauliflower rice “grits,” sweet corn, Gruyère cheese, & more! Optional Peppers – 1 jalapeño (sliced) or chopped bell pepper if you prefer less spicy. First, rice your cauliflower. The best way to do this is to remove stem, cut the cauliflower into small sections. You can also use florets. Then place 1 handful of the cauliflower into the food processor at a time. Pulse until a “rice” texture is formed. Remove, place in a large bowl. Repeat until you have riced all 3/4 lbs of a pound or 1 small head. Next, prepare the rest of you vegetables. Cut/slice, etc. Then grate your cheese so that you have it ready for the pan. Place corn, onion, garlic, oil in pan and sauté on medium high until fragrant, around 2-3 minutes. Add riced cauliflower, paprika, spinach, and cream. 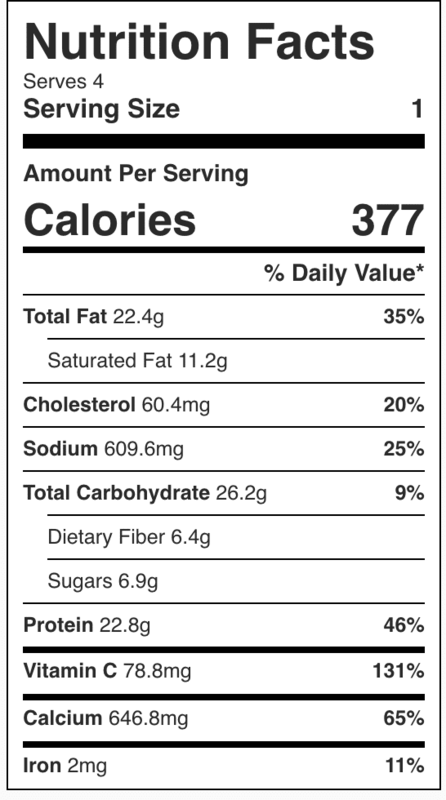 Add optional jalapeno or bell pepper here if desired. Mix all together, then cover and reduce heat for 5 minutes on medium low. Stir in cheese and keep at medium low until cheese is melted in with the cauliflower “rice” grits. *NOTE* If you would like grits to be thicker here, add optional 1 cup cooked quinoa if desired. Remove from heat. Season with sea salt and pepper to taste. Garnish with red pepper flakes and chopped fresh basil to top. Add tomato sauce topping (optional but SO tasty) To make, whisk marinara, coconut cream and melted butter together. Spoon over each serving or bowl. Add extra grated cheese and more basil leaves to top. Protein Option: Feel free to add chicken, shrimp, chickpeas, egg, or any other protein to this dish, although it is filling by itself. Have you ever tried grits? Let alone cauliflower grits? Favorite cheese? I kinda think you have a new favorite after you try Emmis Gruyère. Just sayin…. Keep up with the compassionate fun loving Emmis on social media. They are full of delicious recipe inspiration! FaceBook, Twitter, Instagram, YouTube, and Pinterest. True story: I am a Southerner who doesn’t like grits. But these…. I could totally get behind! I’m British and have no idea what grits are…? But as I am veggie & gluten free I’m going to give this a try, however I really hate gruyere so what do think I should use instead? Have you ever made it with a different cheese? Haha no worries! My husband is a kiwi and he had no idea! Grits are basically thick creamy cornmeal dish .its southern. We usually add cheese and bacon or shrimp. But instead of a “cornmeal” I went for more veggies and lighter! You can use aged cheddar or Parmesan. Keep me posted. You always have epic recipes and this is another!!! I’m going to have to find a way to recreate this without the cheese or corn for Dave! I love the idea of cauliflower grits! maybe coconut milk and nooch? I’m going to try it and I’ll let you know! yes, i think nooch would be perfect!! This dish is giving me all he cravings!! So easy, healthy and full of flavor, absolutely love these grits! I’ve been meaning to re-shoot my cauliflower grits. But yours look so good, I may just leave it. LOL! I love the corn add too. So much flavor going on. OMG yum!! This looks so good!! 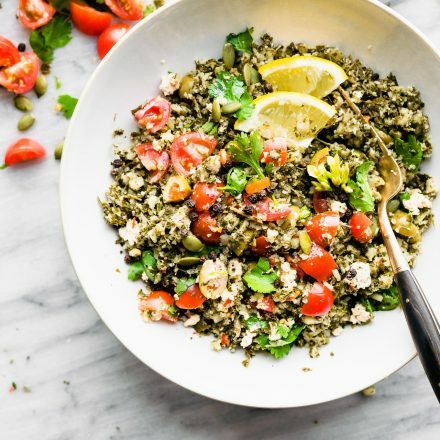 I absolutely love grits and love that you used cauliflower rice!! Cannot wait to try this! You outdid yourself Lindsay! This is over the top gorgeous! Oh HECK yes! Amazing what you can do with cauli rice!!! My southern self is jumping for joy at the site of this dish! Wow, oh wow! 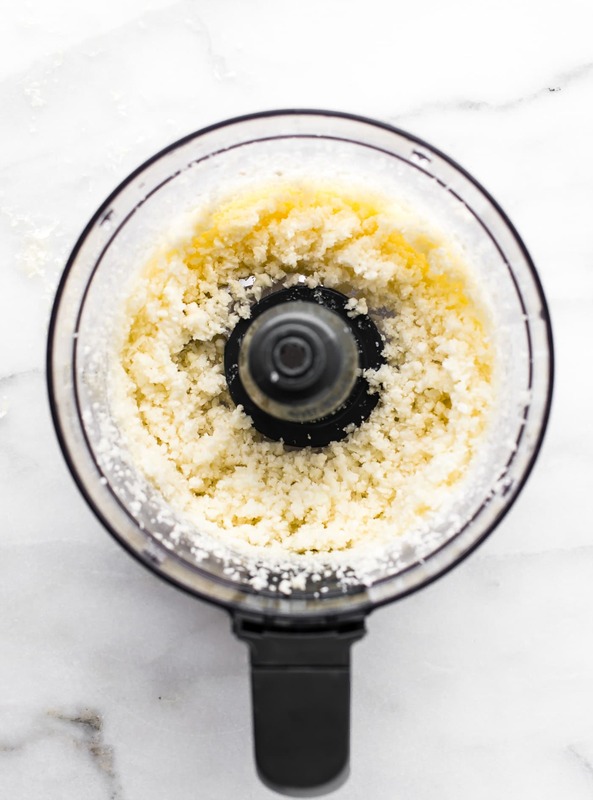 This is absolutely making it into the recipe rotation ASAP! This is really innovative and looks so tasty!! Who knew that cauliflower could work in place of grits?! Wow, this is incredible! I bet that it would taste great with the coconut milk! My favorite kind of cheese Lindsay! And these grits?! Holy moly they sound amazing! I love each and every ingredient on the list. Can’t wait to give this recipe a go! Oh my gosh, grits are my favorite!!! This looks and sounds so delicious! Well it looks like I timed this recipe perfect then, eh? I almost made grits yesterday with sweet corn in it for the base of a recipe and this is making me wish I had! So cheesy and delicious looking! You’re speaking my love language, Linds! Woah… so much to love here! I appreciate Emmi Le Gruyère approach to cheese and I’ll be keeping an eye out for it! I picky about cheese too. We do have a few locally made, like with in 50 miles, cheese that I buy but of course I’ll never be able to get gruyere locally! I just recently started making cauliflower rice and love it SO much, so I know I’ll just die over these grits! Gorgeously captured and delicious work Linds! YASSSS!! What would you replace the cheese with to make this vegan? Nooch and? Can’t wait to try these grits! LOVE Swiss Gruyère Cheese!!! It’s been forever since I’ve had a good bowl of grits, and I’m loving the idea of using cauliflower! I always have some in the fridge for snacking, so this will be a perfect way to use up my extra 😀 Pinning for later! Fantastic. I used a package of prepared cauliflower rice. Topped it with an egg for a healthy breakfast. I want to try it tipped with blackened shrimp. oh that’s genius! i gotta try with egg! 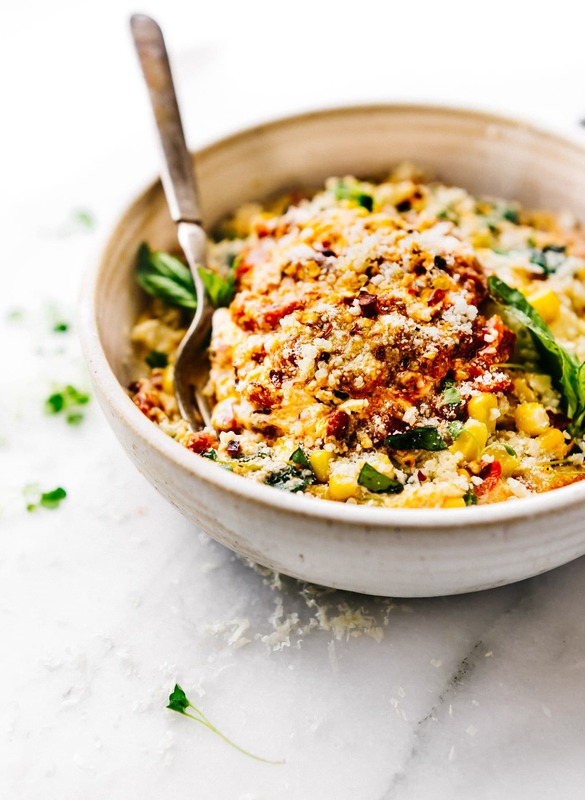 You know I love everything about this dish, from the sweet summer corn, the hard delicious cheese (mmmm, cheese) and the fresh herbs. Ah yes, this sounds amazing. Looks SOOO good and love that it is low carbish…. Cant wait to try it! thanks Tim! Let me know if you do! hey lindsay cotter….! 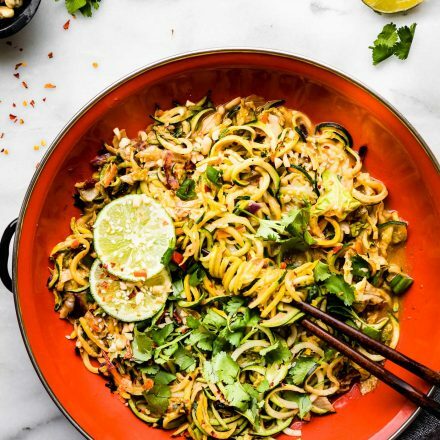 your dish looks so delicious and yummy with beautiful….thanks for the sharing and keep shared your amazing recipes….! Amazing dish, the people of Indian subcontinent will love this very much as there are ethnic veggies. I am not veggies. Don’t get me wrong. I will also taste it.